he Golden Fish Necklace is designed in a way that it hangs in a completely different way. Its sits fits perfectly around a slender neck, resting on the collar bone and in frames your face as if it was a precious painting. The color of these exquisitely carved Ruby Fish, reminded me of the shimmering bodies of rainbow trout. The gem that you see at the center of the necklace is a 3.5ct Pink Tourmaline, which is accented by Australian Opals. 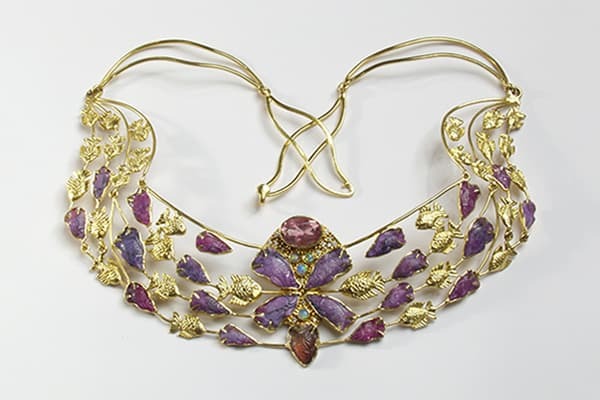 And a total of 37 carats of carved Ruby fish are set in this 22 karat gold necklace. The simplicity of the Golden Fish Necklace is deceptive because it took over a year and a half to hand make. The gold and ruby fish swimming upon these golden waves the Golden Fish Necklace, represent the pure qualities of the human soul, the archetypes that are preserved through time in innate, universal patterns. Fish, like the waters in which they swim, represent the first inklings of life, the primordial strata: the universal ocean of the ancient Egyptians: the chaos realm that was known as Nun,creation’s source. In the mythological traditions of India, tell us that the first form Brahma, the Hindu god of creation, was a golden fish. The association of fish with creation is a recurring theme and shares affinities with the ancient man fish, Enki, the Sumerian lord of creation. This correlation is also found in science, which postulates that the first forms of biological life formed originated from the sea. By swimming in the watery depths, a symbol of the subconscious mind, fish are associated with the secrets of life, intuitive knowledge and the eerie depths of mystical experience. Because of the extraordinary distances that migrating fish are known to cover, the Golden Fish Necklace is also associated with sacred journeys and success. Fish are a particular rich in symbolic associations. They have long been suggestive of fertility and abundance. Most likely this is because of the millions of eggs that they spawn. The Zodiacal constellation of the fish, Pisces, is represented by a pair of fish. In the traditions of sacred geometry a fish shape is known as the ‘Vesica Piscis’. As you can see in the figure to the right, the common center of the two conjoined circles — the shaped formed within their intersection is known as the Vesica Piscis. You can also see that the golden rectangle can be charted from the Vesica Piscis. Maybe you can notice how the 2√ root and 5√ root division of the the rectangle form the tail of the fish. 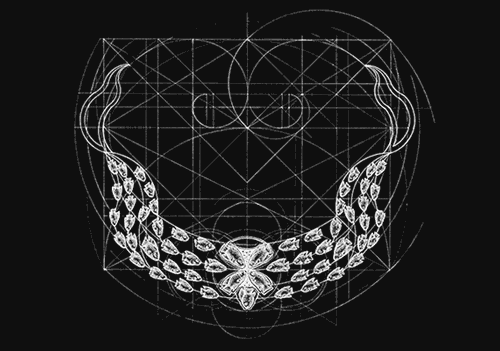 Can you see how the Vesica Piscis underlies the symbolic design of the Golden Fish Necklace? The Curves of the golden waves in the Golden Fish Garland are actually arcs of varying magnitudes of the golden mean spiral.